As Guild VP for programs, I arranged a 2-day weaving with wire and metal workshop with Susan McGehee. You really should take a minute and look at her website; it doesn't begin to do justice to her amazing work. She uses anodized aluminum, copper, silver, and other wires and metals to make her wall hanging and sculptures. Gorgeous, gorgeous stuff. And she's a great teacher and a very nice, down-to-earth person. I really enjoyed listening to her the past two days. Since I'm a very beginning weaver, I didn't participate in the workshop. But I did play around with the wire a little bit. This necklace took about an hour. The process if pretty simple but the stiffness of the wire was hard on my hands and wrists. I enjoyed exploring, but I don't see a lot of wire crochet in my future. I love this book but a couple of things about it bug me. This is the second project I've made, and in both cases the finished item doesn't match the dimensions suggested by the photographs. And yes, I was on gauge for both projects. On this one, the shawl pictured looks oversized, almost to the point of being afghan-sized. In reality, the tips of the front points (before blocking) don't even reach my waist. And the sides fall well above my elbows; they definitely aren't full-arm length as picture. It was the same thing with the first poncho. I realize the models are smaller than us 'normal' people, but there is no way this is the same dimensions as the pattern in the book. 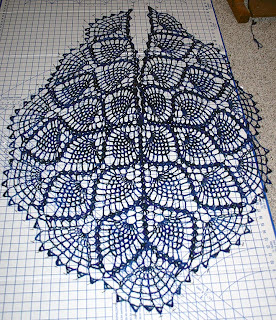 I love the shawl but it bugs me that the photo and the pattern are so different. And the second thing? I don't think the written version of this pattern is accurate. Several times I had to refer to the charts to make sense of what I needed to do. I'm not referring to all the "repeat from * to * 9 times, and from ** to * 4 times, and * to ** x times". I think this could probably have been better written - easier to understand - but after the first repeat, I could see what she meant. But you'd think the tip of each pineapple, for example, would be done the same way. In the chart version, it is. In the written version, it's different. Confusing. And irritating. Would I recommend this book to others? Yes, but not to a beginner. Am I going to make more things from the book? Probably. And am I going to complain when the size is again different from what I expect? Count on it.